SEQUOYAH COUNTY (KFSM) -- Three men who confessed to killing their friend while hiking at Lake Tenkiller last year have been released from jail, Sequoyah County Sheriff Larry Lane said. According to the Sequoyah County District Attorney's Office, the charges have been dismissed due to not enough corroboration in the confessions. "It is heartbreaking that you spent this much time and this much effort in trying to help this family. 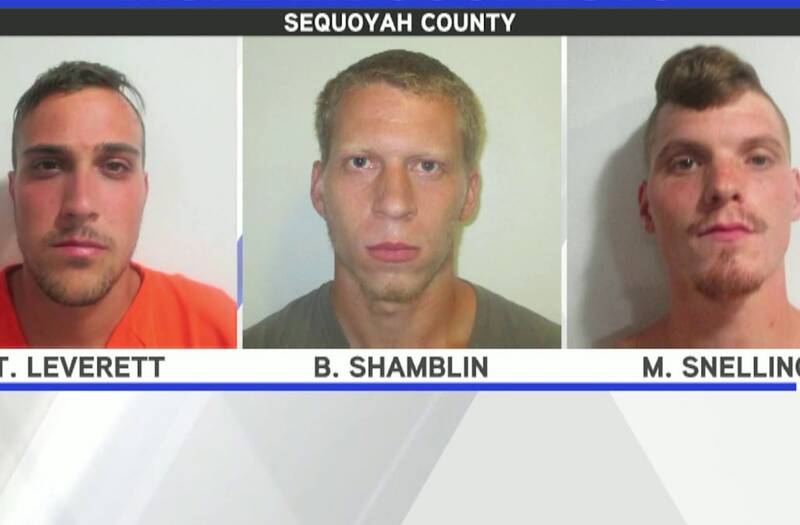 It is aggravating but yet, I fully understand why these three men had to be released," said Sequoyah County Chief Deputy Charles House. House worked endless hours alongside other deputies in the search for Fagan and spoke of the confessions. "A couple lead us to locations to where Mr. Fagan's body might be but it turned up not being there as far as the incident that took place prior to removing Mr. Fagan all of them were in line," House said. According to the District Attorney's office they will continue to investigate this case with the Sequoyah County Sheriff's Department and could file charges in the future. Two others were also arrested in the case for accessory to murder after the fact. According to the D.A. 'S office, those charges were dismissed as well. Tyler Leverett, 22, Charles "Blake" Shamblin, 25, and Michael Snelling, 22, were accused of murdering hiker Matthew Fagan. Fagan was reported missing after a hike at Lake Tenkiller on June 22, 2016. According to probable cause affidavits, Leverett and Snelling blamed each other for killing Fagan, but their descriptions as to how the missing hiker was killed are similar. The accounts from Snelling and Leverett stated that, along with Fagan and Shamblin, they had hiked at Buzzard's Roost Trail on June 21 to find a silver mine. Patrick Ledford drove with them to the trail, but stayed in the vehicle while the four went hiking. Leverett told investigators that after walking 25-30 minutes, Fagan complained of his ankles hurting. Snelling and Fagan then began to shove each other, and Leverett told them to stop. He said he believed Snelling was jealous of Fagan because of a secret relationship with the wife of someone they knew. Leverett told investigators that Snelling hit Fagan with a ball-peen hammer twice in back of the head, after shoving him down. He said that Snelling asked him to help drag Fagan's body to an area where no one would find it, and cover it with branches. Snelling claimed that after walking 20-30 minutes, Leverett and Fagan began arguing, which led to shoving and eventually Leverett getting on top of Fagan and continuously hitting him. Snelling said that Fagan was bleeding badly from his face and nose, and that Leverett told him and Shamblin keep their mouths shut if they knew what was good for them. Snelling then said that Leverett made him and Shamblin hit Fagan with a hammer, according to the affidavit. Snelling said they moved Fagan's body into a drainage pipe before law enforcement came on scene. Shamblin informed investigators that Snelling began shoving Fagan, pinned him down to the ground and started hitting him several times, and then struck him with a hammer. Shamblin also said that Snelling kicked Fagan in the head with his steel-toed boots. He said Snelling made Leverett hit Fagan, as well. They then left the body in the woods, where it was hidden by brush, the affidavit stated. Both suspects told investigators they drove to Ledford's grandfather's house, where they attempted to hide tools which they had brought along in search of the silver mine. Leverett said Snelling wanted to get rid of the tools (two hammers, a shovel and a crowbar) to avoid looking suspicious. Snelling said it was Leverett's idea. Ledford's grandfather told them they couldn't leave their tools at his place, the document stated. After leaving the house that night, Leverett, Shamblin and Snelling went to their homes, but shortly after decided something had to be done with Fagan's body. Both accounts state that they drove to Buzzard's Roost in a truck, with chicken wire, tarps and concrete blocks in the back. They picked the body up, rolled it into a tarp, placed it in the back of a truck and drove down by the water, the affidavit stated. Once near the water, the three took the body out of the truck bed, wrapped it with chicken wire, then placed the body in a tarp and tied it off with rope. Snelling told investigators that concrete blocks were tied to each end of the tarp, as well as the middle. Lerverett said that he went back into the truck with Shamblin because he didn't want to watch. Snelling returned to the truck and said, "The deed is done," according to Leverett. However, Snelling stated that Shamblin and Snelling took the body into the lake, and returned 20-30 minutes later without the body. Shamblin said Snelling made him wrap Fagan's body with a tarp, while Leverett put chicken wire around the body. He said Snelling also had Leverett and him help carry the body down to the boat dock. Shamblin told investigators that Leverett and Snelling threw the body into the water just beyond the edge of the boat dock. He claimed that Snelling had expressed an interest in "getting rid of Fagan," so the secret relationship would be over and the wife and friend of theirs could get back together. Investigators had used cadaver dogs near the lake, and both dogs alerted within feet of each other in the water of a cove, later pointed out by Leverett as the place where he said Snelling put Fagan's body in the water. A sonar search in that cove indicated something 6-9 feet underwater, but divers could not locate anything.